The Mexican Revolution of 1910–1920 is among the world’s most visually documented revolutions. Coinciding with the birth of filmmaking and the increased mobility offered by the reflex camera, it received extraordinary coverage by photographers and cineastes—commercial and amateur, national and international. Many images of the Revolution remain iconic to this day—Francisco Villa galloping toward the camera; Villa lolling in the presidential chair next to Emiliano Zapata; and Zapata standing stolidly in charro raiment with a carbine in one hand and the other hand on a sword, to mention only a few. But the identities of those who created the thousands of extant images of the Mexican Revolution, and what their purposes were, remain a huge puzzle because photographers constantly plagiarized each other’s images. 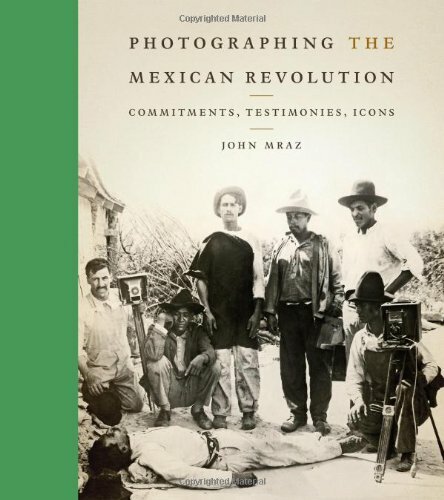 In this pathfinding book, acclaimed photography historian John Mraz carries out a monumental analysis of photographs produced during the Mexican Revolution, focusing primarily on those made by Mexicans, in order to discover who took the images and why, to what ends, with what intentions, and for whom. He explores how photographers expressed their commitments visually, what aesthetic strategies they employed, and which identifications and identities they forged. Mraz demonstrates that, contrary to the myth that Agustín Víctor Casasola was “the photographer of the Revolution,” there were many who covered the long civil war, including women. He shows that specific photographers can even be linked to the contending forces and reveals a pattern of commitment that has been little commented upon in previous studies (and completely unexplored in the photography of other revolutions).